Are you on a budget? If so, planning a cheap summer vacation may literally be the last thing on your mind. Luckily, there are many travel deals and discounts available. By taking advantage of these deals and discounts and with careful planning, you can easily have a great cheap summer vacation, even with limited financial resources. 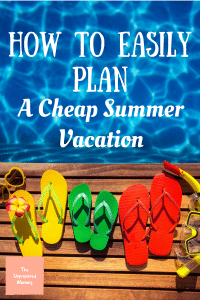 So, how can you plan a cheap summer vacation in 8 easy steps? We all have ideal summer vacation destinations. Pick your top two or three favorites. Which would be cheaper? If on a budget, keep costs in mind. You want to have the vacation of your dreams, but make sure you plan a trip you can actually afford. When choosing your destination, keep seasons in mind. Some vacation destinations, like Hawaii and Florida, are popular all year round. Others, like Colorado, are season specific. Colorado is most popular with skiers in the winter. You are likely to find more summer travel deals and discounts because it is considered their off-season. Once you have a destination in mind, choose your travel dates. If on a budget, consider shortening your trip. Yes, you may be accustomed to weeklong vacations, but what if you can’t afford one? Opt for a three or five day trip instead; you automatically save money. When choosing your travel dates, keep events in mind. The more activities that are happening around town, the more expensive hotels rooms are and they harder they are to come across. Try to avoid the weekend of July 4th, when a popular concert is taking place, or a business convention. If opting for a hotel, go to the well-known travel websites, like Priceline.com or Kayak.com. If opting for a private vacation rental, focus on websites designed for these rentals. Price compare. Different hotels and private vacation rentals have different fees. Online travel websites are known for their moneysaving deals on travel packages. Save money by booking your airfare, hotel, and car rental in one large package. Unfortunately, online travel websites do not always give you the best deals. Luckily, it is easy to tell. They should give you the names of the hotels, car rental companies, and airlines. Visit their websites and request more quotes. Compare the two. Go with the cheapest. Once you have found the cheapest travel package or independent reservations for a hotel, car rental, and your flight, make your travel plans. Many experts claim the best time to book reservations is early Tuesday or Wednesday morning. Since you already booked your airline reservations, car rental, and hotel, focus on the other aspects of your trip. These include food, activities, attractions, souvenirs, and so forth. For example, if you had $1,500 to spend and your airfare, hotel, and car rental totaled $900 for the week, you have $600 left. Once again, you already booked your hotel, car rental, and airline tickets. Focus on attraction admission costs, activity rental fees, food, and souvenirs. Visit online travel websites to familiarize yourself with local activities, attractions, and restaurants. Examine online menus or attractions to get an average cost idea. Then, estimate the cost of each meal, activity, and so forth. You now have a good idea how much you can expect to spend on your summer vacation. In step 7, you estimated the cost of travel and in step 6, you determined how much money you had available to spend. Compare the two. If your vacation looks like it may be more than you can afford, start cutting corners. Opt for a fast food restaurant, instead of a sit down restaurant one or two nights, try to find parks and other attractions with low or no admission fees, and so forth. I do like that you suggested visiting the websites of different online website travels so you can see the services that they offer and be able to request more quotes. My husband and I are looking for a villa to rent. We have a limited budget for our vacation, so it will be ideal for us to shop around to find the best deals that we can take advantage of. Thanks for sharing this.